When I saw this on the For the Love of Food and Photography blog, I knew it would have to become one of my 12 handmade Christmas adventures. Something about it being a super cute, thrifty, two minute DIY project really got my attention.... are we surprised? 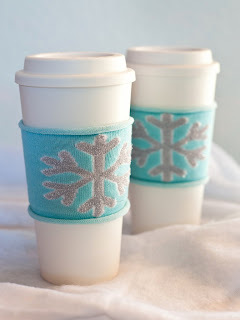 I actually saw the same cups used in the post at Liquidation World (aka BigLots) for $5, which makes this a thrifty DIY that can actually be accomplished at the prices being blogged about. I have big, big love for that. Do you have any favourite DIY projects involving socks?